It's true, now that I think of it. Most of my favorite restaurants feature a resident dog or two. Theres the German Shepherd at the Southwest place, and the New Orleans restaurant in the 3rd where I used to go for chili that had a pair of Whippets. Restaurant dogs by nature have to be calm, cool and collected. They never whine or beg, and something really important has to happen if they are going to do anything but disceetly keep an eye on things. 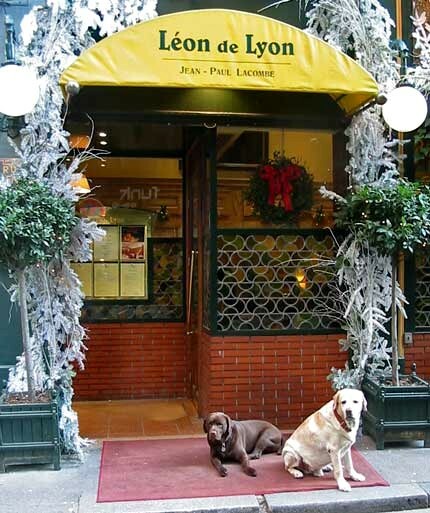 These two are often seen at their favorite sentry spot out front at Leon de Lyon. They love it when the paparazzi snaps photos of them on their red carpet. How do they cultivate such calm in those restaurant dogs? Ours couldn't be persuaded to be so unflappable! The life of a dog ~we should have it so good! Great post!